※ The covering area of some type of curtains may recess due to the components on both sides. For more information, please check "Spec" introduction in every product page, or contact our staff. Measure the size of windows or other installation areas accurately can prevent these awkward situations from happening: unfitting oversized headrail, unable to install because of shallow frame, or cannot cover the window due to downsized drape etc. 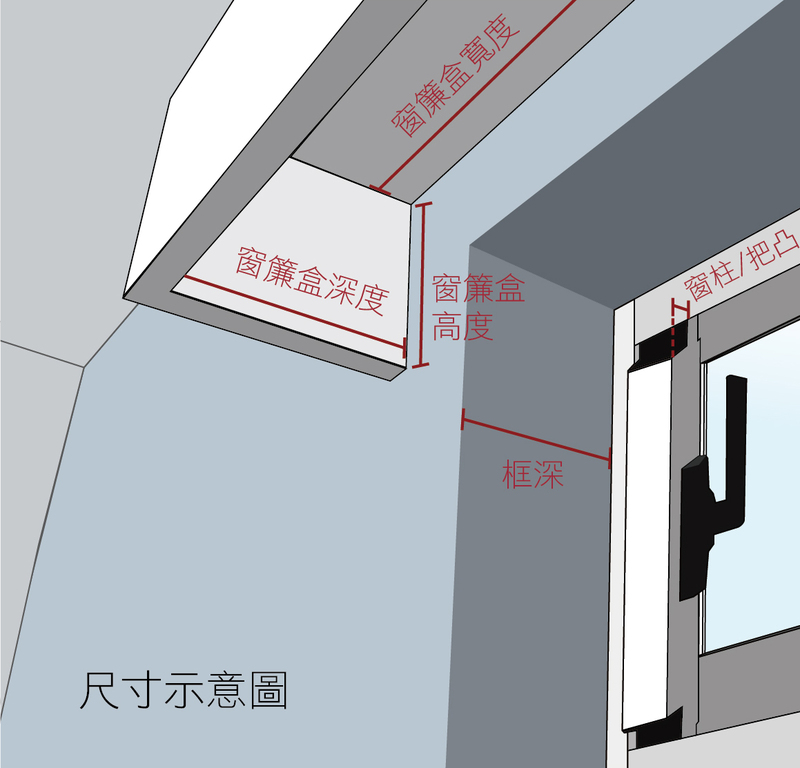 ■ Common obstructions around window such as wall, corner, roof beam, air-conditioner, pipeline, furniture, wooden blinds box decoration, etc should be taken into consideration to make sure the covering area of curtain remain intact and complete. Also, the height between the bottom of window and the floor are the references for the length of ballchain cord. The frame here does not refer to the metal frame of window, but the window recess. Do not measure th area of glass only. The following pictures show the different effects of Inside Mount and Outside Mount. Neat and tidy outlook, suitable for solid materials like roller blinds,venetian blinds, other blinds with solid material etc. Measure three positions: top, middle and bottom. Write down the "minimum sizes” of three positions, and that is the curtain width. Measure three positions: left, middle and right. Write down the "maximum size" of three positions, and that is the curtain height. Can cover the window completely without light leaking in; also hide window frame, increase covering area and reduce light leak in from surroundings. Also can serve the purpose of covering windows and adjust visual effect of the space. Suitable for curtains, gauze and other drapery with soft material etc, preventing windows from being covered after the curtain is drew. Measure the in frame height + extra height expected to cover = height needed. ■ Extra 7~10cm is suggested on top of in-frame width and height. Actual possible covering area depends on the environment or effects. ■ If there is a curtain box. curtain box, even for hard material blinds. ↑ 2 pics from the left are inside mount. The pic at the right side is outside mount. Decide and record the sizes of inside mount or outside mount. ■ Width and height can’t exceed the range within STEP 1 . ■ The installation and covering area of blinds should be flat and smooth. No obstacles. ■ For installation within curtain box or inside mount, reduce 0.5~1cm is suggested to leave some buffer, in case some adjustments are needed. ■ The sizes of finished products are the total height and width (including systems). Yes, that's right! You can see that measuring and buying your own curtain is not that hard. All you need is these three steps, and finish size measurement. Now, get ready for shopping! For DIY lovers, MSBT provides more fashionable and quality choices to create a more comfortable and to add ... moremore styles to your beloved space. We provide measurement and installation manuals of all blinds and curtains. We have instructions in video format in our official website. Complete components are enclosed in the shipment. Even DIY beginners can easily get the hang of it and won't panic about it! Our professional staff have rich experiences in field service on decoration site. They can provide professional ... moreconsultation, thoughtful explanation with samples demonstrating operations to solve your problems. In-home service is available in certain cities in Taiwan: Keelung, Taipei, Taoyuan, Hsinchu, Miaoli, Taichung, Tainan, Kaohsiung, and Pingtung downtown. There will be charges for in-home service. For appointments, please contact MSBT for further details.